The Goku Midnight Cowboy ramen adorned with a big slice of Texas-style brisket. Photo courtesy of JINYA Ramen Bar. The combination of barbecue and ramen seems almost inevitable in our modern, no-holds-barred food culture. The comfort food of Texas meets an ideal companion in a humble bowl of ramen noodles, the ultimate comfort food and unofficial national dish of Japan (sorry Chef Jiro). In particular, tonkotsu ramen, with its characteristically rich pork broth and thick noodles, is especially well-suited for the addition of smoky, rich beef brisket. The Goku Midnight Cowboy ramen at JINYA Ramen Bar in midtown Houston. Photo by Carlos Brandon. Such is the case at JINYA Ramen. 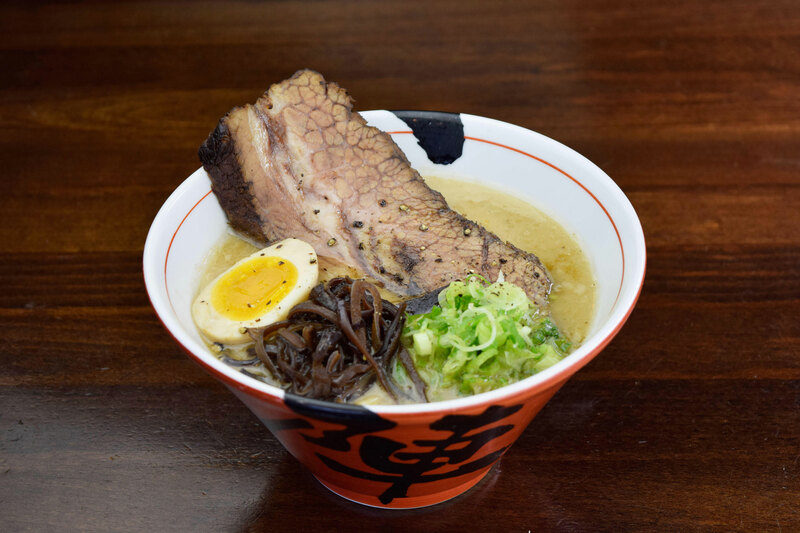 The Goku Midnight Cowboy is a traditional tonkotsu noodle soup with the notable addition of two huge slices of braised beef brisket. Houston Food Finder was recently invited to JINYA’s Midtown location to sample this new fall menu item. The soup’s broth packs a punch of savory pork flavor without being too fatty or creamy. The traditional tonkotsu noodles are thick and almost al dente, appearing a bit under-cooked at first but predictably softening within minutes in the hot broth. The brisket was fully present in the dish; not a thinly sliced garnish but two large hunks of succulent beef. The JINYA brisket is made in-house at each location, and despite not partnering with an established pit master, the noodle shop still manages to expertly cook the beef to a point that is both fall-apart tender and sufficiently firm. 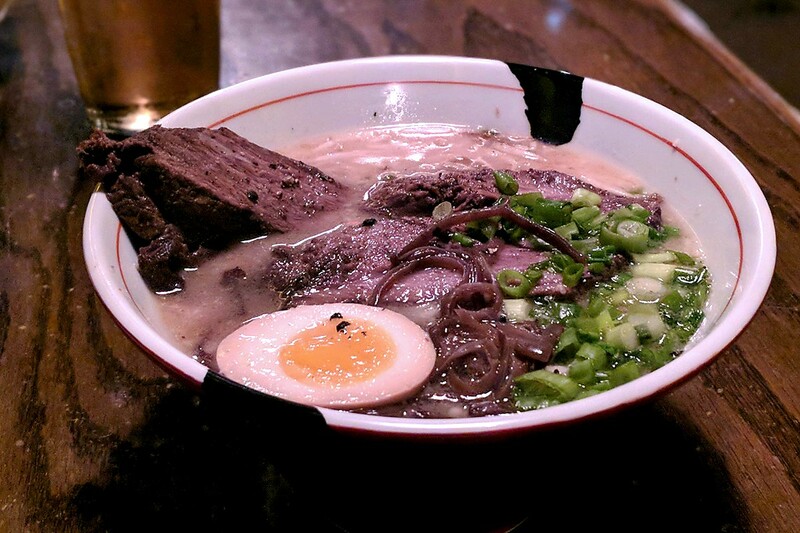 The broth flavor is, of course, infused into the beef, creating a flavor profile not entirely unique to either barbecue or ramen —which ultimately is the goal. Beef aficionados are encouraged to stop into their nearest JINYA location for lunch or dinner soon. The $20 specialty bowl is only offered on JINYA’s menu through the end of November. That said, given the bowl’s outstanding quality and the obvious charm of this tried-and-true combination, fans of the dish can rest easy knowing it’s likely JINYA is going to offer this gem again sometime in the future.